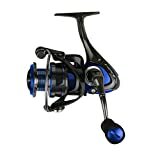 Spinning reels are the most popular type of fishing reel due to their simple design, line capacity, ease of use, and precision. 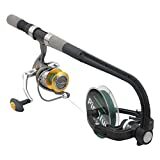 Regardless of your style of fishing or level of expertise, spinning reels are the uncontested choice for beginners, experts, and everyone in between. Knowing which spinning reel is right for you may be difficult without understanding the best make or model for your fishing style. 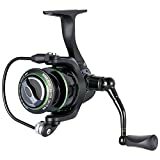 We are here to help you understand the difference among the various spinning reels on the market, so that you feel confident in choosing the reel that fits your needs and will last for years. Graphite spinning reels: Spinning reels made from graphite boast lightweight, flexible bodies that are easy to maneuver and minimize fatigue during long periods of use. Graphite also has anti-corrosion properties, which is important if you plan to fish in salt water. Aluminum spinning reels: Spinning reels constructed from aluminum are strong, durable, and make for a long-wearing product. Aluminum models provide a lot of support and rigidity when reeling in larger catches. 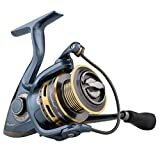 Front-drag controlled reel: With the drag located at the front of the reel, these models boast strong and durable drag systems that make for a smooth reel operation. Front drag mechanisms are ideal for larger catches. Rear-drag controlled reel: With the drag located at the backside of the reel, these models’ drag systems are easily accessible for adjusting tension in your line. The rear drag’s accessibility allow you to quickly adjust and customize the tension of the reel’s drag system based on what fish you are trying to catch. Based on all the consumer reviews we’ve scanned, these are the top things they mentioned about their new spinning reels. Reel smoothness: Crucial for a spinning reel to be effective and to not stick. Look for products that are coated with titanium or stainless steel to avoid traction or stickiness. Ball bearings: Prioritize how many ball bearings your spinning reel will come with when choosing your spinning reel. 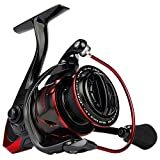 The more ball bearings, the smoother your spinning reel will function. Consumers recommend a minimum of four ball bearings for optimal performance. Price: The quality and longevity of your spinning reel is directly correlated to how much money you spend on your reel. Consumers recommend choosing the best model you can afford, as it will not disappoint. You should choose the size of your reel depending on the weight of the line you are planning to use. When shopping online, check the product chart for its line capacity to make sure it fits your needs. The reel ratio of your spinning reel should reflect the speed and force of your fishing style. A slow ratio (4:1) means slower speeds reeling in a fish, but a high torque for retrieving large fish. A fast ratio (6:1) means a faster retrieval speed. A sealed waterproof drag system is a noteworthy innovation to the spinning reel. 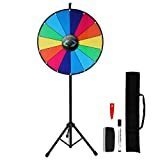 Preventing the reel from exposure to the elements ensures your spinning reel will run smoothly for a longer time. Anti-reverse handles are crucial for your spinning reel. This kind of handle will prevent the line from circling backwards when you reel in your catch, making for a more accurate and efficient retrieval. Okuma Fish & Tackle: Founded in 1986 by Taiwanese fisherman, Charles Chang. Since its beginning, Okuma has expanded globally and is an industry leading fishing tackle brand. PENN: Founded in 1932, PENN has remained at the forefront of modern reel design and production within the fishing industry. Pflueger: Has been in existence since 1881, where it began as a hook manufacturing company. Since its founding, Pflueger has evolved to manufacture all sorts of fishing tackle and gear. 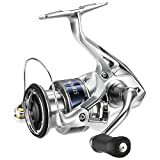 Shimano: Founded by Japanese visionary Shozaburo Shimano over 80 years ago, Shimano is a fishing and tackle company that concentrates on precise engineering to make products of only the highest quality.